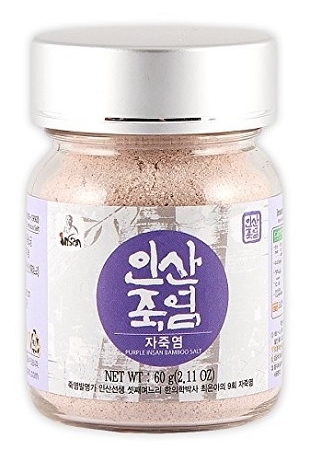 Bamboo Salt is an ormus-rich, therapeutic salt made in Korea using a process developed over 1000 years ago by Buddhist monks. The making of bamboo salt incorporates the five elements (Water, Earth, Air, Fire, and Aether). It transforms sea salt into a highly bio-available condiment with unusual healing and detoxification properties. The five element process begins with sun-dried sea salt from the Korean Bay (the element of Water). The salt is packed into bamboo stalks that are 3 or more years old. Bamboo can reach 50-foot heights in a short period of time, consuming unquantifiable amounts of cosmic energy during its growth (bamboo provides the element of Aether). Next, the bamboo is sealed with mineral-rich yellow clay from the surrounding region (the element of Earth). Salt-filled bamboo stalks are then fired/roasted at 1600°C (the element of Fire), using pine wood from the local region (pine wood provides the mechanism to incorporate the element of Air via oxygen as the bamboo is burned). The above process is repeated up to nine times and can take three years to complete. Each time the salt is fired, impurities are burned off and nutrients from the bamboo and the clay are assimilated into the salt. Repeated firing gathers and concentrates ormus elements and sends them into a high-spin state. Adding bamboo salt to water releases and stabilizes ormus. Other minerals that may already be in the water are activated and held in a readily available state within the water. Ultimate Purple 9X is uniquely available from the Insan Bamboo company. It is roasted one additional time at a higher temperature to liquefy the salt and allow it to crystallize. Other producers market 9X bamboo salt without the final, high temperature process that activates the most ormus. Ultimate Purple 9X Bamboo salt can be used to energize drinking water by making a saturated salt solution. The addition of 1/8 to 1/4 tsp. of the saturated bamboo salt solution to a half gallon of water before structuring, balances the water with a full complement of minerals and ormus. Bamboo salt is especially high in sulfur which is easily detectable in its taste. Sulfur is the third most abundant mineral in the human body based on percentage of total weight. A large number of individuals are deficient—especially the elderly and the vegetarian community. It is one reason organic sulfur supplements like MSM (methylsulfonylmethane) and DMSO can be so helpful. The addition of biologically available sulfur from bamboo salt supports many metabolic functions. However, it may cause a detoxification reaction and is not necessarily recommended for those who are sensitive to sulfur. Bamboo salt also contains high amounts of bio-available iodine—critical in today’s environment. The salt is abundantly supportive of the thyroid. The unique alchemy that results during firing/roasting, appears to augment the drawing qualities of bamboo salt for a truly balancing, cleansing effect on the body, mind, and spirit. Solutions made with bamboo salt are also therapeutically used as nasal rinses, gargles, and eye washes (mix 1/10 tsp of the powdered 9X salt in 1 cup of water). Bamboo salt also makes a wonderful footbath (dissolve 1 tsp of the Purple 9X in a gallon of warm water and soak for 20-40 minutes). One of the things ormus has been reported to do is to interact with DNA in a manner that opens the way for an organism to return to its original genetic blueprint. With this in mind, the regular use of bamboo salt in structured drinking water could be an important innovation for a time when exposure to genetically modified foods, bacteria, and viruses is prevalent. Plants that have been exposed to genetic modification may benefit too. Wow! Bamboo salt may be one of the most potent natural remedies I've ever tried. I'm losing weight, my appetite is strongly suppressed, I'm energized and feel very sharp witted. I’ve been using Himalayan Pink Salt, Celtic Grey and Real Salt for many years. Bamboo salt is different and much stronger. The process really makes a powerful change in the salt. This salt is so easy on my system and has made a positive difference in multiple health issues, especially sinus and skin. Also, it came very quickly.